Contact On Task Organizing via phone (919)561-0885 or e-mail nancy@ontaskorganizing.com, or send a message through my contact form to book a complimentary phone call or video chat to discuss your organizing needs in depth. During this chat, you will be asked many questions about your current situation and organizing goals. You can then schedule your first in-person or virtual organizing session. On Task Organizing is based in Raleigh, North Carolina and offers services within a 30 mile radius including Raleigh, Cary, Garner, Apex, Holly Springs, Fuquay-Varina, Morrisville, Clayton, Wake Forest, Knightdale, Durham, Chapel Hill and surrounding areas. The total cost varies based on the scope and size of each project. You can take a look at my upfront rates here. Please contact me if you have further questions about rates or services. The type of space, current contents, number of people involved, and decision making time will determine how long the project will take. In between organizing sessions, I will research products to improve your organization. Payment is due at the time of service by cash, check or credit card for in-person services. An online payment is due in advance via credit card for all virtual services. On my first visit to your home or office, I will begin with an in-person organizing assessment. During the assessment, I will ask many questions and walk through your home or office with you to discuss your organizing goals for each space. You do not need to clean or organize anything prior to my arrival. After the assessment portion, I will devise a basic action plan for the session, review the client agreement with you, and begin hands-on organizing in your home or office for the remainder of the visit. What will other visits be like? After the complimentary chat and first in-person organizing session, I will work with you to determine a plan to best organize your space. Each session will be scheduled in time blocks of 3 hours or more. I will be by your side as we sort through items and organize your space. Future visits are scheduled based upon your needs, and the size and contents of the area that needs organizing. Do you follow-up after organizing a space? Yes, you will receive a follow-up email after each organizing session. This email will include a basic action plan, a list of follow-up tasks and storage product suggestions (if needed). After your space is organized, maintenance or follow-up visits can also be arranged. Learning the skills to maintain an organized space requires time, and often assistance from a professional organizer. I can schedule a follow-up visit at any time to make sure you’re on task with your organizing goals. On Task Organizing follows the National Association of Productivity and Organizing Professionals Code of Ethics which includes the utmost confidentiality. No, I will help you to sort through each item and decide what is needed and the best location for that item so it can be easily accessible. During the process, some items may be discarded, but that is the client’s final decision. Yes, organizing sessions are offered by appointment Monday through Saturday. In-person sessions are scheduled in blocks of time 3 hours, 6 hours or 8 hours. The 3 hour sessions can be scheduled for mornings (9am-12pm) or afternoons (1pm-4pm). 6 hour sessions generally take place from 9am-3pm, and 8 hour sessions take place from 9am-5pm. Will you help me with donations? 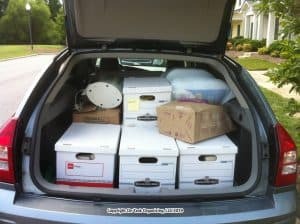 At the client’s request, I will bring one car load of donations to a selected local donation center free of charge at the end of an organizing session. You will be provided with a tax donation receipt. At the client’s request, The On Task Organizing vehicle is packed and ready to bring tax deductible donations to charity at the end of an organizing session.